The movie theatre is already completely full and, at the entrance, a small crowd keeps pressing to enter. In the projection booth, Alfredo is working, as usual, with the assistance—and perhaps even more so with the companionship—of little Totò. The projectionist has an idea: using mirrors, he intercepts the beam of light coming from the projector that is destined for the screen, and directs it towards the façade of a building in the piazza opposite the theatre. 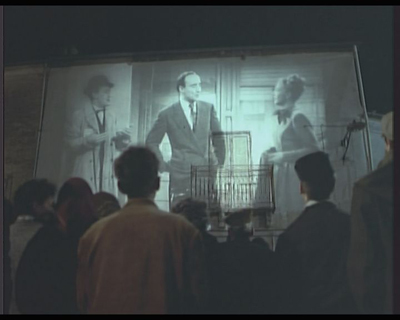 And that is how the film also comes to life on the walls of the large building, and the waiting crowd, spellbound, are now able to watch it. One of the building’s residents protests, but then he too is captured by the spectacle. An habitué of the piazza tries to sell tickets, with the excuse that this place belongs to him, but he is jeered at. Everyone is fascinated by the new magic. 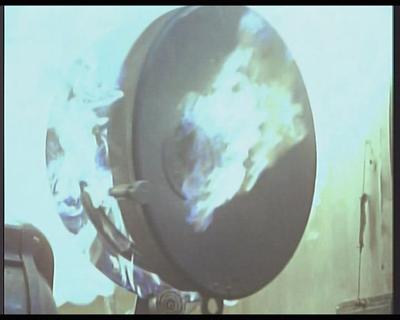 Suddenly, however, a fire breaks out in the projection booth. The flames quickly spread to the rolls of film, the posters hanging on the walls, the furniture. Alfredo battles to put out the fire, but he is attacked by the flames, and drops to the ground. Totò has returned to the projection booth, and he drags the projectionist down the stairs all the way to the piazza, where in the meantime the crowd has dispersed. The fire continues, with no one able to put it out. The movie theatre is destroyed. Alfredo, whose face was struck by the flames, loses his sight. Many readers will have recognised this—one of the most famous sequences in Cinema Paradiso (Giuseppe Tornatore, Italy, 1988). In a film overflowing with symbols, this excerpt offers at least three major metaphors. The first concerns cinema’s desire to leave its traditional location—to go outside the movie theatre—in order to find new environments in which to bring its images and sounds alive. This is an age-old desire. Antonello Gerbi, in a remarkable article of 1926, notes, “A projection made without a screen, onto an empty space, where will it end up? It will appear to vanish into the air; it will dissolve into a vague luminous nebulosity” (Gerbi 1926, 846) . Nevertheless, adds Gerbi, “nothing gets lost in the universe” (ibid. ): film characters, although out of their element, and in the form of ghosts, will continue to be with us. The second metaphor, on the other hand, concerns the risk of death cinema runs in leaving the movie theatre. The beam of light is diverted from its natural destination, the screen, and that is why a fire sends the building up in smoke (the one and only temple in which the cult of viewing should be celebrated), and permanently blinds Alfredo (the officiant of this rite). It is therefore dangerous to look for new spaces: for one might release forces that no magician, no matter how expert, knows how to control. Finally, the third metaphor is the one that foreshadows a potential revival of cinema. Totò, in rescuing the man who is his putative father from the fire and dragging him towards the piazza, behaves a bit like Aeneas carrying Anchises on his shoulders out of burning Troy towards new shores. He is someone who saves (it is no coincidence that—although the short form of his name is Totò—his full name is Salvatore Di Vita, literally, Saviour of Life), and at the same time someone who guarantees a future (nor is it a coincidence that he will become a famous director). The cinema will continue to live; in fact, it will find new locations in which to develop. A little over twenty years after Giuseppe Tornatore’s film was made, and a little under sixty years after the events related by the film, cinema’s exit from its temple has been achieved. The theatre screen has been transferred to a great many other screens, starting with those belonging to the four media that now dominate the scene: the plasma or LCD television, the computer or tablet, the mobile phone, and finally the LED media façade. The cinema is everywhere, even if dressed up in other clothes, or mixing with other people. It survives as a television offering, but also as files to download from the Internet, as a work saved on a DVD or a flash drive, in the form of an entire film, or on clips as shown on YouTube, although re-edited in the form of mashups or re-cut trailers, to be watched at home, or shown on public transport, transformed into installation art, shared between fans. Hence, even as cinema is lost from the movie theatre it is found elsewhere, in new locations. So, which paths does this gigantic relocation of cinema follow? What casualties does it take with it? And to what extent does it represent the continuation of a story? The cinema’s shift out of its old confines seems to follow two main paths. At the centre of the first path is the object: the film. Unable to recreate all the elements of the traditional theatre experience, we secure the what to see, independently of the how. A good example is the switching on of my DVD player when I am on a train. I could have passed the time in some other way: by reading the newspaper, telephoning someone, chatting with the people next to me. I have decided instead to watch a title I had missed a few months before, and that I have now rented from a Blockbuster outlet. So I now take the disk, insert it in the machine, put on my headphones, and start watching. I might also have been able to locate this title on the Internet, in which case I would have had to switch on my laptop or my iPad, get connected, and download the file. In this case I would have had access to the film without necessarily passing through a connecting link, such as the one offered by the DVD—unless I had saved the file on a flash drive, for example. This means that on the Internet I am accessing images without using any physical media, while with the DVD I need to have physical media on hand in order to access the images. But putting aside this difference, important as it may be, in both cases I start with the what to see. It is because the object exists that I can get an experience under way. And so I concentrate on what appears on the screen, I try to grasp the thread of the story and I immerse myself in the world presented. In this way, in addition to being a traveller, I become a spectator—a bit like being at that movie theatre that I had not managed to get to. Yet there is no auditorium: the film being screened exists, but the environment connected to the screening does not. The place where I am now seems just the reverse: with its noises, its activities, its comings and goings, it seems to interfere with my attempt to be a spectator. Therefore, I must modify the environment, in order to be able to watch a film. The acts I can perform are minimal, but useful: I stretch out on my seat, I draw closer to the screen so that it takes up a large part of my visual field, I raise the sound on my headphones so it is louder than the background noise, I minimise what is going on around me. The effect is the creation of a space all my own, in which there is only room for the film I am watching, and in which the flow of the external world seems suspended. It is an imaginary space, however, an existential bubble in which I take refuge because I want to, not a ready-made physical place in which I can take my seat, as the theatre is. If it is true, then, that even on the train I can find the opportunity to isolate myself from what surrounds me and to concentrate on the images and sounds, it is also true that it happens because I force the situation, and I personalise it. Naturally, this personal construct proves to be fragile and temporary: all that is needed is for the conductor to ask me for my ticket, or the people next to me to raise their voices, or for the train to simply arrive at my station for my bubble to dissolve. The experience, dependent on the film object and no longer supported by the environment, all of a sudden pales: I am no longer able to feel I am a spectator; I am once again just a traveller. I remove the disk from the DVD player, or I disconnect from my laptop or my iPad. I also stop watching the film. Figure 5: Watching film on a train. [Image by striatic]. The second path is exactly the opposite. The cinema experience is reactivated far from its canonical locations, not so much because of the availability of an object as because an environment suited to it exists. That is what happens with my home theatre, for example. Here what matters is the fact of being in front of a wide screen, enjoying the images and sounds in the best way possible, being surrounded by walls that shut out the outside, being able to lower the lights, being able to relax in a chair with food or drink to hand. Or rather: what matters is that these conditions have been given to me in real terms, and that I do not have to reconstruct them through my imagination. Thanks to them, I actually attain, without any effort, that isolation from the outside and that concentration on the images and sounds that make me feel like I do at the movie theatre. Therefore, it is how I see, rather than what I see, that triggers the experience. It is the modality, rather than the object, that turns me into a film spectator. It is no coincidence then that what I am watching can also change, without me changing the register of my experience. Let us suppose that, from a film filled with special effects (it was to watch this type of film that I bought my home theatre), I have now moved on to watching an episode of a television series, or the match of my favourite team that is under way. Both the objects, albeit to different degrees, are foreign to the cinematic world. And yet, if I watch them on my home theatre, the environmental features that I mentioned before can give a cinematic quality to what I am watching. The vastness of the screen, the soft lighting and the suspension of what surrounds me see to it that I view the episode not as one usually watches a television programme—in a distracted and discontinuous way—but as one watches a film—with concentration and attention. But even the soccer match takes on features peculiar to the cinematic product—after all, is it not a spectacular representation of the world, with a good number of actors and extras, halfway between reality and fantasy, with a story that unravels and suspense that keeps it going? So then, while the first journey of relocation returns an object to me and at the same time requires me to do something to the environment, here I find an environment for myself, and I can remodulate the object. Naturally, my work of adapting the object to the situation does not always hold up. If, for example, my enthusiasm for my team is reawakened and, instead of staying relaxed in my chair, I begin to behave like I would in a stadium, that is all that is needed for the cinematic dimensions of the experience to fade; dependent only on environmental aspects, it begins to subside. By this time I am on my feet, I am waving my scarf and singing my team’s anthem; I have stopped being a spectator, and now I am happy just to be a supporter. So then, two paths. The cinema is relocated because it makes what I want to watch available somewhere else, or because it recreates somewhere else the best conditions for watching it. In the first case, I am dealing with the film object of viewing that is presented to me where I am now; in the second, with a viewing environment that is reproduced where it is possible. On the one hand, a conveyance occurs: a delivery; on the other, a reorganisation of the space: a setting. Each of these two paths has a history behind it. The processes for delivery began in the 1960s, when television first offered us the opportunity to watch films on the small screen, thanks to some quite popular programmes, the first and the most famous of which was NBC Saturday Night at the Movies in the US. This broadcasting was self-serving, directed more towards increasing the number of television viewers than increasing the cinema’s audience. And the broadcasting was not always ideal: the presentation of the film was interrupted by commercials; it was squeezed into a set time slot, with cuts made to the film if necessary; and often it was spread over two weekly programmes, with the film sometimes divided into two halves. Nevertheless, it was also the first step in a migration of the cinema to a new environment. This migration intensified in the mid-1970s with the advent of cable television and its dedicated channels. The first company in operation was HBO, and it is no coincidence that its most valuable pay-TV programming was sport and cinema. HBO was followed in 1976 by Showtime and in 1977 by Ted Turner’s superstation WTCG-TV (later WTBS); in 1983 the former merged with The Movie Channel, while the latter bought the rights to the MGM library in 1986 and to a substantial portion of the RKO library in 1987. HBO, in turn, in 1980 created Cinemax, a channel dedicated entirely to cinema, which also promoted new productions. At this point, film had found a home on the television screen. In the same year that cable TV (or cable and satellite) entered powerfully onto the scene, another delivery tool attained widespread public success: 1975 was also the year of the VCR, with its two standards in competition with each other, respectively VHS of JVC and Sony’s Betamax. The VCR originated as a device to tape-record television transmissions so they could be saved for future viewing, but it quickly proved its worth as a tool for reproducing pre-recorded works: this led to a widespread trade in films on videocassette, which could be purchased or hired from specialised shops and then taken home to watch whenever one wanted—with options to select particular scenes, to speed up or slow down the tape, to reverse, or to advance frame by frame. So again, cinema was penalised: the VCR forced it to get rid of the strict temporality, that is imposed by the auditorium, where spectators are obliged to follow a film’s continuity and progression; in exchange, the VCR offered it further circulation opportunities. The trajectory that started with the DVD in the 1990s and then, most importantly, the Internet in the first decade of the new millennium, this trajectory will no doubt continue: viewing will acquire further and more complex features, and the film—now compressed on a disk, and downloadable at any moment and in any place—will become increasingly accessible. The arrangement of environments that recall the cinema also has a history behind it. For example, beginning in the 1960s, museums—especially museums of natural history— started to use screens with moving images in place of traditional display cabinets or dioramas more and more frequently. They did this because they wanted to modernise the forms of presentation of the objects (a need that had already emerged at the turn of the twentieth century); in this way, however, they drew frequent accusations of abandoning science for the sake of spectacle, or pedagogy for the sake of entertainment. Retailers also followed a similar route: shops and department stores presented film clips with the merchandise they were selling; in this way they made the objects more desirable, but also further increased the enjoyment of the mise en scène tied to commerce. But, as the end of the twentieth century drew near, it was the city itself that was increasingly turning into an exhibition space: big billboards gave up their places to gigantic moving images; road signage often adopted an animated form; transit stations, waiting rooms and streets were filled with screens; and walls became media façades, a transformation of the future that Blade Runner (Ridley Scott, USA, 1982) depicted. And finally, in this same period, an analogous transformation was invading the home: not only was there an enrichment of the number of appliances that liberate people from their domestic chores, but, most importantly, there was an incorporation of communication and entertainment tools: stereo, fax, printer, video game consoles, video displays over thirty inches—finally arriving at the home theatre, in a sense, the ultimate end point of these gadgets. The home had become a smart house, and in this smart house more and more weight was given to the consumption of spectacle. This look backwards reveals how the operations of both delivery and setting have accompanied the cinema for a good part of its most recent life: it has been able to make films accessible for a long time, and at the same it has been able to find suitable spaces for viewing, even outside the theatre. However, it is not until the new millenium that the two paths at the core of cinema’s relocation broadened and became more visible. This occurred—and, at the same time, was made possible—through the introduction of two types of media. On the one hand, we have a series of devices aimed specifically at transporting contents: we no longer have just the DVD player, desktop or laptop; we now also have the notebook, tablet and smartphone. These are used to give consumers who call for it access to texts, images and sounds of any type, anywhere and at any moment. So these are extremely flexible media, that is, they are ready to adapt to the demands of whoever is using them. Moreover, they are relatively neutral, that is, they are capable of hosting material without compressing it inside their own parameters. And, finally, they are interchangeable, meaning they can also be activated in the place of other devices. In this respect, they leave behind even the recent past, when the consumer had to adapt to the tools (the film spectator submitted to the screening requirements), media and their contents were intertwined (every text in the newspaper became a news item) and every medium was worthy in itself (radio and television were not only two appliances but, in a sense, two different worlds, as well). Faced with an impetuous increase in material and situations these media aim to deliver what is most needed, in the most direct and, at the same time, most focused method possible. What they lead to, then, is a “personalised media delivery system” (Morley 2007, 210) thanks to which, we can basically have every thing in every situation. On the other hand, we have a series of devices that work in reverse. More than just being transporters of the contents, they set up the environments that the consumer can enter. I am thinking here of video games, which draw me into an imaginary universe; but also of augmented reality, which redesigns the real-world territory I am traversing. In both cases, there is a world that takes shape in which I can immerse myself and with which I can interact. These are true environments for experience, in the sense that they offer an environment and literally let us experience it. The system that animates them is not too distant from that of theme parks, in which the visitor plunges into a new reality; the simulation here can reach its apex, as it does with Wii, which transforms my room, one moment, into a tennis court, the next, into a boxing ring. These two types of media, the media-delivery and the media-environment, occasionally overlap. Microsoft Office, installed on my computer, provides me with both the opportunity to retrieve material from the archives of the Internet or my folders, and the possibility to enter into a virtual space that is modelled on my everyday work space. However, these two types of media also reveal two different systems, which have at their centre, respectively, the contents and the environment: in one case, everything revolves around the texts, images and sounds that I want to get hold of; in the other, everything depends on a context straight out of the real world that I want to access. The expansion of media follows both systems, but often with distinct strategies and effects. The relocation of the cinema, today, is reacting to this scenario. It is also following two paths—in fact, it clearly distinguishes them. And it offers me, one moment, an object to view, leaving to me the task of imaginatively completing the environment in which I see it, the next, a viewing environment, leaving me with the option of selecting the object. This double choice allows the cinema to capture a broader slice of territory. It can make films go anywhere, and at the same time recreate elsewhere the typical way to enjoy them. The relocation of cinema can proceed in all directions. There is, however, a counterpart to this expansion, and it is not insignificant. It is not only transformations that the cinema experience inevitably heads towards: on the television screen, on the DVD player, in the home theatre, on the computer or on tablets, we are losing the linearity and progressiveness of viewing, we are losing the boundaries between film and other types of products, and we are losing the pleasure of searching for the film in the place where it is being screened. This is something more radical: with relocation, a traditionally unitary experience has been split in two. The cinema has long been both something to watch, and a way of watching something. It has been a body of films, and it has been an apparatus (projector, screen, theatre). The fact that, one moment, it is directed at the object, leaving the environment incomplete, and, the next, at the environment, leaving the object undefined, introduces a profound breach between the what and the how. Cinema becomes either the film object, or a way of watching films. Two things—no longer just one. It is quite true that there has been tension in the past between the object and the modality of the cinema experience. In the 1920s,when the luxurious and elaborately decorated Movie Palaces were flourishing and, even more so, during the same years, when the Atmospheric Theatres—with big skies painted on their ceilings and landscapes often depicted on the walls—become fashionable, it was the viewing site rather than the film being screened that was exalted. It is an environment that tells us, first of all, what the cinema is: the ability of the world to turn itself into a spectacle. Sigfried Kracauer, in a 1927 essay devoted to Berlin’s large movie theatres, also brings to light the sense of this spectacle: if we look at the theatres’ architecture and fittings, we understand that the representation of the world is more truthful the more it communicates an idea of superficiality and externality—that superficiality and externality that are characteristic of the new ways of living. By contrast, when, between 28 October and 30 December 1934, Iris Barry presented a film series entitled The Motion Picture, 1914-1934, at the Wadsworth Atheneum in Hartford, Connecticut, and, even more so, when she repeated much of the programme about a year later at the MoMa in New York, what was highlighted was the object of the filmic experience (Barry 1936–37). Iris Barry was aware of the importance of the modality of a film’s presentation, so much so that in the first schedule of the programme at the MoMa, in introducing The Execution of Mary Queen of Scots, she mentioned that the film had originally been intended for peep shows (the Kinetoscope), and was only later projected on the screen. But for her the cinema was above all a collection of works that gained their intrinsic value from the way in which they were shot, recounted, performed. This value is established through the manner and the place in which the works are enjoyed: hence her decision to also present, for example, simple fragments and, more importantly, her decision to present a film in an art museum. In fact, in this seemingly unsuitable space, the artistic completeness of the films were able to stand out even more. So, even in its classical period, the cinema identifies, one moment, with a modality of viewing (which seems to exalt the superficiality of the world become spectacle), the next, with an object of viewing (which appears, instead, as often endowed with an intrinsic depth). Two poles. And yet we never doubt that the one can exist without the other. It is no coincidence that critics between the two wars often slipped from one aspect to the other. Louis Delluc, who carried out a methodical battle for quality films at the turn of the 1920s in France, also provided us with detailed analyses of the various Parisian movie theatres, each with its own characteristics and its own audience (Delluc, 2008). And Robert Desnos, who was among the finest critics of the 1920s, did not refrain from describing what happened to him while he was watching a film in the middle of the audience (Desnos, 1966). Relocation splits this unity. Today, the identification of the cinema, one moment, with something to watch, the next, with a viewing quality, bound above all to the environment, is starting to become exclusive. 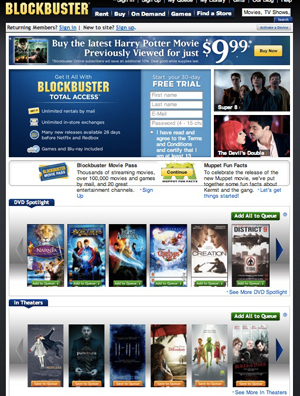 At the top of Blockbuster’s home page is a window that alternates information about the films currently showing in theatres, information about the availability of films to rent, and information about the modality of buying films “on demand”; lower down on the same page we have four horizontal bands with rows of posters, devoted respectively to “DVD Spotlights”, the films still screening in the theatres, the “New Releases” and finally the latest films (“Coming Soon”); all the titles offered can be rented or purchased as DVDs or Blue-ray discs, but they can also be downloaded from the Internet for a fee. Here cinema is reduced to an archive of works that we can access—it does not matter how and where we then watch them. 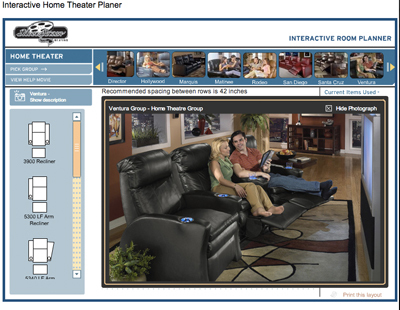 Figure 7: Elite Home Theater Architects website. 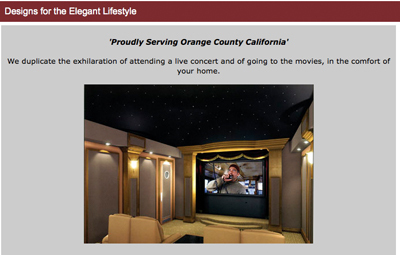 On the opposing front, on the home page of a California company, Elite Home Theater Architects, which specialises in the installation of home theatres, a caption reads, “We duplicate the exhilaration of attending a live concert and of going to the movies, in the comfort of your home”; in the pages that follow we are shown various models of the home theaters that are available, with very generic references to the films that can be screened there. Here cinema is a viewing modality, indifferent to what we then actually choose to watch. The home page of Family Leisure, a chain of stores that sells “pool tables, tanning beds, spas, above ground pools, patio furniture, game tables, gas grills, fireplaces, bars, games, poker tables, and more”, goes even further: we see a carefully arranged row of lounge chairs, with all the comforts of cinema seating, but almost without the screen (barely visible, an object evidently not for sale), and with a pay-off that reads, “Stay Home for the Movies”. Here the films have literally disappeared: and the cinema becomes nothing other than a place in which to be comfortable. There is no lack of moments in which the two fronts—delivery and setting—draw close to each other. 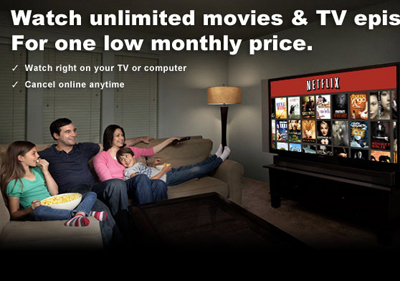 For example, the opening image on the home page of Netflix shows a family at home in front of a screen and in the meantime the titles lead straight to the immediacy and ease of gaining possession of the films you want to see: “Streaming instantly over the Internet to your computer & TV” and “Watch as often as you want, anytime you want”. On the face of it, we have an environment and a product; but then, looking for the availability of movies, we realise that the films can be downloaded wherever and whenever we want, and therefore that domestic space fitted out like a theatre is only one of the possible environments in which the viewing can occur. I will add that the representation offered by Netflix also signals a nostalgia for a traditional form of consumption, which may be able to return: however, it is now one among many, and not necessarily the only one. So now there is the sense of a rift: the cinema is either an object, or it is a modality. The consequence is undoubtedly serious: the cinema experience is heading towards an unavoidable bifurcation. It will be a filmic experience, if it leads to the what, or a cinematic experience, if it leads to the how. Two types of encounter; two modes of doing; two forms of pleasing. Moreover, Roland Barthes had already forecast this rift, in one of his finest essays: “Whenever I hear the word cinema, I can’t help thinking hall, rather than film” (Barthes 1989, 345). Barthes may have been breaking up a word in order to isolate the two meanings, yet he was also choosing one of the two to the detriment of the other. His love went to the auditorium, inside of which he could literally “décoller” (take off), rather than to the film on the screen, to which he had to “encoller” (glue himself). Barthes was anticipating the moment when the cinema would be facing two paths. As for us, we are already in a divided territory. To be precise: the filmic, or the cinematic. Moreover, this is not the only rift that strikes the cinema when it is relocated elsewhere. Let us consider urban screens, for example, both the large format ones mounted in the public squares of many cities, and the more moderately sized ones found in shops, transit stations and along roads. Their presence offers passers-by a dual choice. They can stop to look at what they are displaying and, seduced by the images—especially if they are large-scale—can try to immerse themselves in them. In order to do this, they not only have to bring their own journey to a halt, but must also isolate themselves from the surrounding environment, let themselves enter into what they see and abandon their activities for a moment. In short, they must stop being passers-by, and try to be spectators. But they can also conversely continue to walk, just casting a glance at the screens in the same way we look around us to monitor the environment in which we move. In this case, they will not immerse themselves in the images; they will give them a cursory glance focused simultaneously on many spots. They will not be spectators, but accidental observers. Now, the presence of these two opposing choices has the effect of bringing to a halt the coexistence of two forms of attention that the cinema knew how to hold together: in the theatre, I could let myself fall into an attentive gaze, and at the same time I could relax to the point of distraction. The passer-by, on the other hand, is at a crossroads, and when faced with the screen must choose between two opposing forms of experience. Let us now consider domestic screens. The home theatre demands not only concentration from us—after all, it is what we ask it to do—but also a series of acts that help us to connect with what we are watching. We have set aside the time devoted to our viewing, we try to take a break from our round of commitments, we enter the room, we lower the lights, and we let ourselves relax into the chair: in short, we follow the steps of a little ritual. The screen of the television set up in the kitchen works differently: we watch it while we do our domestic tasks, while we eat, while we converse with the rest of the family. It does not demand a ritual from us: it leaves us to our everyday lives. The consequence is a rift in what the cinema was holding together: in the theatre, rituality and everyday life are intertwined; at home, the two aspects are separated, and presented as opposing experiential poles. I am moving forward too quickly, but I just want to give an idea of how a unit breaks up. So let us also consider mobile screens, meaning my smart phone or my tablet. I use them to access a series of images, of texts, of sounds: at the centre of my relationship with them lies a process of appropriation. But these screens are also instruments of control, both active and passive. I use them to follow events around me, to stay in contact with other people, to take photographs, to find out where I am: in short, to monitor the surrounding world. And by using them, I myself am held under surveillance: someone can track me, or rather, someone does track me. The consequence, again, is a schism between what the cinema was holding together. While the cinema gave me the sensation of being able to both explore the world and appropriate the world, now I must choose: either to navigate towards the discovery of new territories, or to pay careful attention to my own, trying to not lose sight of it (and perhaps trying to be lost to sight myself). This series of schisms signals a profound transformation in the cinema experience. Much more than the loss of a place, i.e., the theatre, or of a support, i.e., the film, or of a community, i.e., the audience, it is the profound rearticulation of a viewing regime that seems to threaten the continuation of cinema’s journey. Cinema Paradiso expresses it well: after the fire that destroys the town’s cinema, and after Alfredo has lost his sight, nothing will ever be the same again. It is true: a new hall will be built, new projectionists will do the work, new films will be screened, but that conjunction of collective interest and personal involvement, that ritual dimension that spread out onto daily life, that desire to be surprised associated with a kind of social control exercised in this case by the priest, all these aspects will no longer be able to embed themselves in each other so as to form a, seemingly, contradictory but, in reality, very solid whole. The cinema will become a composite object, whose singular sides will at times refract very different realities. Does this mean that the cinema, in being relocated, is somehow heading towards its death? Cinema Paradiso also speaks to us about a continuity. Totò, now a famous film director, returns to the village of his childhood for Alfredo’s funeral. The villagers recognise him: not only was he a minor hero in the past, he is now a prominent figure. At the end of the funeral he receives a package that Alfredo had kept for him. Inside are the film clips that the priest had wanted to expurgate from the scenes that, in his opinion, were too risqué, and that the projectionist had religiously preserved. These clips, that Totò watches when at home, are, literally, a legacy. Just as his profession, or perhaps his mission, is a destiny. A legacy, a destiny. There will always be films to watch—and films that bind us to the cinema. There will always be someone ready to offer us a special gaze on the world—a gaze that has been peculiar to the cinema. This leads us back once again to the two paths of relocation. Let us examine their mechanisms further, and try to understand how, while, on the one hand, they break the cinema in two almost to the point of killing it, on the other, they actually ensure its survival. In the processes dedicated to delivery, the film that I am watching appears as a sort of fragment of the cinema: it is a component, however essential, of what I can experience in the theatre; or also, more simply, it is one work among the many that make up the body of film production. I gain a cinema experience because I gain the experience of one of its little pieces—a little piece of what it regularly offers to its spectators, as well as a little piece of what it has been and is. What the relocation then guarantees me is a part that stands or should stand for the whole: in this sense the operation is based on a metonymy (to be precise: pars pro toto). Naturally, this operation will acquire much more value the more the part provided to me knows how to actually bring the whole with it. More specifically: my cinema experience (even though limited to the film—so, more correctly, my filmic experience) will be more intense and complete the more that the film I am watching, for example, on my DVD player, makes me re-experience the pleasures I felt watching it in the theatre, or makes me understand the story better, or carries with it the success it attained at the box office, or tells me about the current trends in production, etc. This is why a film on DVD benefits from having had a life on the theatrical circuit (and not only for mere advertising reasons): it is thus a fragment that knows how to testify better, and can report to me better, on the whole to which it belongs. On the other hand, in the processes based on a setting, what I am offered is an environment that is as similar as possible to that of the theatre. Here we are no longer dealing with a fragment, but rather with a copy. I am thinking, for example, of the home theatres built by the architect Theo Kalomirakis, who drew on the large Movie Palaces of the 1920s and 1930s: we can recognise the design—or at least many of the details—of Hollywood’s Chinese Theatre, Los Angeles’ Pantages Theater, New York’s Radio City Music Hall, or some large cinemas of San Francisco or Brooklyn. The resemblance aims not simply to create an imitation of the past, but literally to revive the atmosphere and spirit of those temples of the cinema—to create the conditions for a perfect spectatorial experience, as the architect himself stresses again and again. This is an experience centred above all on the environment and viewing conditions, rather than on the object of the viewing (and, in this sense, it is fundamentally a cinematic rather than a filmic experience). But to the extent that it imitates the experience of going to the classical cinema, it will seem quite full and satisfying. Naturally, since no home theatre, however perfectly modelled, is a film theatre, here the copy functions also and, most importantly, as a substitute. I undergo an experience in place of what I would have had at the cinema, even though it is like being at the cinema. In this sense, we can easily say that the relocation based on a process of setting operates not by metonymy—as does the one based on delivery—but by metaphor. 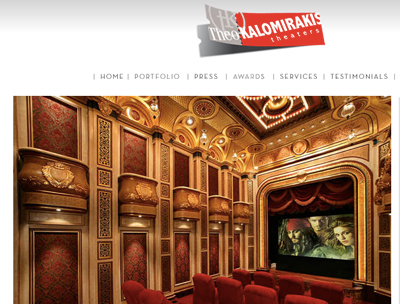 Figure 9: Kalomirakis Theater website. Fragment and copy, metonymy and metaphor. These are not only two different strategies through which to relocate the filmic experience, but also two different modes of referencing the cinema, of recalling its essential traits, and thus of guaranteeing the relocated experience its own completeness—we could also say: its own authenticity. Let us then take a step further in this direction in our analysis. In the processes of delivery, I am, in a sense, carried back to the canonical cinema experience because I have between my hands something that had been in contact with it (the film I am watching on my DVD player, after all, was actually screened in the theatre, or in any case it was produced to do so). What I possess is only a remnant; but it is a remnant that had been part of the large body of the cinema. From this point of view, I am dealing with a relic. 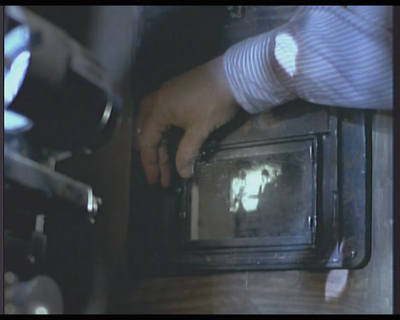 The clips in Cinema Paradiso that Alfredo preserved with care, in order to leave them to Totò, who now looks at them with nostalgia for a time gone by, function precisely like relics: they are fragments belonging to an entity that has now been dispersed, but nevertheless they are able to make cinema present—they are able to convey its sanctity, if you will. On the other hand, in the case of the processes of setting, the viewing environment—in particular, the home theatre—carries me back to the canonical cinema experience, not by virtue of contact, but through the force of recreation. It has been constructed in the theatre’s image not through a mere aesthetic choice, but so as to make me re-experience, thanks to this resemblance, the sensations that I would have had if I had been in the cinema. So we are dealing with a representation (not with the remains of a body, as in the case of the relics: literally, ea quae relicta sunt); this is a representation charged with, and capable of, reincarnating the spirit of the cinematic situation par excellence. This means that the viewing environment I am in now is fitted out so well that it has all the characteristics of an icon. In Cinema Paradiso, in the absence of a place in which to screen the films again, it is Totò himself who becomes an icon: he reincarnates the roles, passions and dreams of a pure cinephile, and at the same time tries to reincarnate the great story of the cinema in the work he does. In each case, the fact remains that the relic and the icon, with their underlying systems, are above all what guarantee the “authenticity” of what I experience. It is the contact with what cinema has been, and at the same time the reincarnation of cinema in its replica, that see to it that the experience that I am going through continues to be a cinema experience. No matter how fuzzy, distorted, or discoloured (I am paraphrasing Bazin), this experience is not only the memory of a model: “it is the model” (Bazin 1967, 14). The relocation of cinema is also, however, transformation, variation. In recreating a cinema experience, it changes, and often goes beyond, what cinema is. Authenticity is not necessarily in conflict with the change. Something is authentic not in itself, because it reaches us intact from a past, or because it constitutes the only one preceding a series of subsequent revivals. Rather, it is authentic because we consider it as such, taking into account the story in which it is immersed, and therefore opening us up to its possible variations and possible variants. In “Epistemo-critical prologue” to The origin of German tragic drama, Walter Benjamin states quite openly: “The authenticity—the hallmark of origin in phenomena—is the object of discovery, a discovery which is connected in a unique way with the process of recognition. And the act of discovery can reveal it in the most singular and eccentric of phenomena, in both the weakest and clumsiest experiments and in the overripe fruits of a period of decadence” (Benjamin 1977, 46). Authenticity is not a fact; it is the fruit of a recognition that knows how to look both backwards, towards a presumed origin, and forwards, towards the most unpredictable outcomes of a journey. Benjamin further clarifies this fact, speaking precisely of the origin and the original. “That which is original is never revealed in the naked and manifest existence of the factual […]. On the one hand it needs to be recognized as a process of restoration and re-establishment, but on the other hand, and precisely because of this, as something imperfect and incomplete” (46). Again, the originality, the authenticity, does not reside in the facts, but in our recognition; and this recognition carries with it, in addition to the effort of a reconstruction, the acceptance of an inadequacy. And again: “There takes place in every original phenomenon a determination of the form in which an idea will constantly confront the historical world, until it is revealed fulfilled, in the totality of its history” (Benjamin 1977, 45). The original, the authentic, is bound to the formation of an idea, but an idea that is only clarified along the entire journey of an object or a phenomenon, and that, only at the end of this journey, knows how to define what is faithful to it or not. “Origin is not, therefore, discovered by the examination of the actual findings, but it is related to their history and their subsequent development” (46). This journey of the object or the phenomenon unfolds earlier in the process, towards a pre-history, and subsequently, towards a post-history. And finally: “This dialectic shows singularity and repetition to be conditioned by one another in all essentials” (46). In the journey of an object or phenomenon, what appears original and authentic and what appears derived are mutually bound, and always appear together. It is then by taking into account this picture—which is a matter of not a fact, but a recognition, not a single point of the story but its entire journey, not an object but an idea that supports it—that we can easily say that the relocated experience speaks, at the same time, the language of authenticity and that of transformation. A relocated experience is its model, but in its becoming, in its being stretched between a pre-history and a post-history, between what has been and what will be (or also between what could have been and what could be). This is why it is at once so faithful and so treacherous, to the point of containing forms of experience that seem literally at the limits, or even further—forms of experience that seem to deny their own model. But this way, and only this way, is it a cinema experience. Barry, I., c1936-7. A short survey of the film in America circulated by the Museum of Modern Art Film Library. Programs 1-5a. New York. Barthes R., 1989. Leaving the movie theatre. In: The rustle of language. Berkeley: University of California Press, pp. 345-349. Original: Barthes, R. 1975. En sortant du cinéma, Communications, 23; then In: Le bruissement de la langue: essais critiques, IV, Paris, Seuil, 1984, pp. 407-412. Bazin, A., 1967. The ontology of the photographic image. In: What is cinema? Berkeley, Los Angeles, London: University of California Press, pp. 9-16. Original: L’ontologie de l’image photographique, In: Bazin, A., 1958. Qu’est ce que le cinéma? Paris: Ed. du Cerf.. The essay was originally written in 1945. Benjamin W., 1977. Origin of German tragic drama. London: NLB. Original: 1928. Ursprung des deutschen trauerspiels. Berlin: E. Rowohlt. Benjamin W., 1999. The arcades project. Cambridge, Mass. : Belknap Press. Blade Runner. Directed by Ridley Scott, USA. 1982. Blockbuster. [online]. Available at: <http://www.blockbuster.com/> [Accessed: 28 November 2011]. Bruno, G. 2002. Atlas of emotions. Journeys in art, architecture, and film. London: Verso. Canudo, R., 1988. The birth of the sixth art. In: Abel, R. French film theory and criticism: a history/anthology, 1907-1939. Princeton, N.J.: Princeton University Press, vol.1, pp. 58-66. Original: Canudo, R., 1911.Naissance d’un sixiéme art. Essai sur le cinématographe. Les Entretiens Idéalistes, 25 October 1911, then in L’usine aux images. Paris: Etienne Chiron, 1926. Cavell, S. 1982. The fact of television. Daedalus, Fall. Now in: Cavell, S. 2005. Cavell on film. Albany: Suny Press, pp. 59-85. Cinema Paradiso. Directed by Giuseppe Tornatore. Italy, 1988. Desnos R., 1926. Charlot, Journal littéraire (13 June 1925). Now in Desnos, R., 1966. Cinéma, Paris: Gallimard, pp. 145-46. Elite Theater. [online]. Available at: <http://elite-theater.kalsow.com/>[Accessed: 1 October 2011]. Ellis J., 1982. Visibile fictions. London: Routledge. Family Leisure [online]. Available at: <http://www.familyleisure.com/planagram> [Accessed: 1 October 2011]. Friedberg A., 2000. The end of cinema: multimedia and technological change. In Gledhill. C. and Williams, L., eds. Reinventing film studies. London: Arnold, pp. 438-52. Gerbi A., 1926. Iniziazione alle delizie del cinema. Il Convegno, (7)11-12, 25 November 1926, pp. 836-848. Griffiths Al., 2008. Shivers down your spine. Cinema, museum, and the immersive view. New York: Columbia University Press. Klinger B., 2006. The new media aristocrats. In: Beyond the multiplex. cinema, the new technologies, and the home. Berkeley: University of California Press, pp. 17-53. Kracauer S., 1995. Cult of distraction. On Berlin movie palaces. In: Levin, T., ed. The mass ornament: Weimar essays. Cambridge: Harvard University Press, pp. 323-328. Original: Das Ornament der Masse, Frankfurt, Suhrkamp Verlag, 1963. The essay was written in 1927. Manovich, L., 2001. The language of new media. Cambridge, Mass. : The MIT Press. Netflix [online]. Available at: <https://www.netflix.com/> [Accessed: 1 October 2011]. TkTheaters. [online]. Available at: < http://www.tktheaters.com/> [Accessed: 1 October 2011]. I refer, naturally, to the theatre that the cinema fashioned in its institutionalised phase, when it changed from a simple assembly point for a crowd to a place where an audience gathered. The transition, during the first decade of the twentieth century, from a theatre that was still a place of confusion, to theatre as a disciplinary place in the Foucauldian sense of the word, was documented in Italy in, for example, Gualtiero Ildebrando Fabbri’s novel Al cinematografo, Milano, P. Tonini, 1907 (intended as a gift to the most assiduous spectators of Milanese theatre of the day), and by articles such as Tullio Panteo’s Il cinematografo, “La Scena Illustrata”, 19, 1 October 1908 (now in: Aldo Bernardini, Cinema muto italiano II. Industria e organizzazione dello spettacolo 1905-1909, Bari-Roma, Laterza, 1981, 236). In any case, the tumultuous and disorderly theatre will continue to live for a long time, especially in working-class cinemas. Regarding the home theatre, see, among others, Klinger, 2006. The difference between modes of viewing at the cinema and in front of the television has been framed in various ways. See the distinctions between gaze and glance proposed by John Ellis (1982), and the distinctions between viewing and monitoring proposed by Stanley Cavell (1982). NBC Saturday Night at the Movies is the first weekly programme, beginning September 1961, to present relatively recent films, in colour, in a time slot of ninety minutes. Prior to this programme television hosted only films in black and while, generally second-rate, and reduced to a length of one hour. NBC’s programme immediately had an influence on the programming of the other channels, which created rival series such as The ABC Sunday Night Movie or The CBS Wednesday Night Movies; but also the programming of the same channel expanded in the direction of cinema, with programmes such as The NBC Monday Movie or NBC Tuesday Night at the Movies. On the new temporality of DVDs, see Friedberg, 2000. On the immersive view in museums, see Griffiths, 2008. I read in this trend a direct influence of the New York World Fair of 1965–6, dedicated to “Man’s Achievement on a Shrinking Globe in an Expanding Universe” in which the presentation of the most recent scientific and technological discoveries was made with the use of film clips often projected onto a multiple number of screens: the pavilions aimed not only at providing information and knowledge, but also at creating environments in which the visitors could immerse themselves. 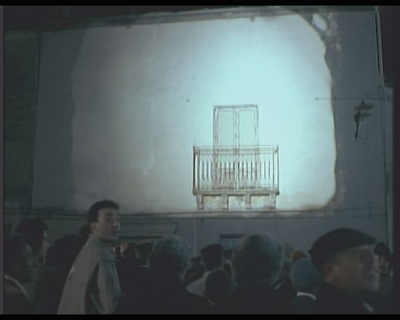 On the Atmospheric Theatre, and on the architecture of the interiors of cinemas between the two wars in general, see Bruno, 2002. “This emphasis on the external has the advantage of being sincere. It is not externality that poses a threat to the truth. Truth is threatened only by the naïve affirmation of cultural values that has become unreal and by the careless misuse of concepts such as personality, inwardness, tragedy and so on–terms that in themselves certainly refer to lofty ideas but have lost much of their scope along with their supporting foundations, due to social changes” (Kracauer 1995, 326). Lev Manovich speaks explicitly of the fracture between an immersive gaze and a gaze devoted to control (Manovich, 2001). 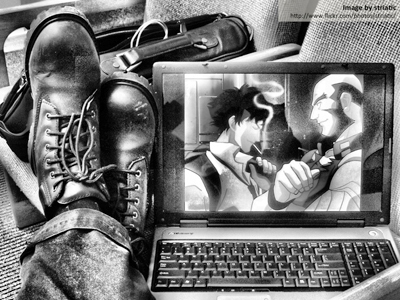 Here I try to expand on the picture suggested by Manovich. Brett Anderson, Theo Kalomirakis’ Private Theaters, Malibu, Calif.: Home Theater Magazine; New York: Distributed by Harry N. Abrams, 1997. See also TKtheaters. “Like the great movie houses of the early 20th century, the theaters that Theo Kalomirakis designs lure the audience away from everyday life into a tantalizingly polished and detailed space. Visual refinements in color, light, and texture, as well as spatial transitions, from entering the outer lobby to taking a seat in the auditorium, prepare the client almost ritualistically for the proper experience of the movie. Regardless of their size, they all share a common trait—the theater experience.” And again: “Theo Kalomirakis is the recognized pioneer in the design and development of opulent home theaters; his designs are the gold standard for clients who have the wherewithal, and the space, to dedicate to the ultimate residential cinematic experience” (TKtheaters). It is sufficient to remember this passage of the famous “manifesto” on the cinema as sixth art by Ricciotto Canudo:“When [cinematographic theater] becomes truly aesthetic, complemented with a worthy musical score played by a good orchestra, even if only representing life, real life, momentarily fixed by the photographic lens, we shall be able to feel then our first sacred emotion, we shall have a glimpse of the spirits, moving towards a vision of the temple, where Theater and Museum will once more be restored for a new religious communion of the spectacle and Aesthetics” (Canudo 1988, 64-65).